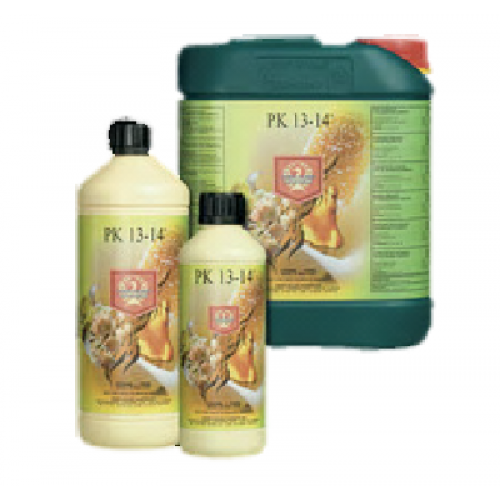 House and Garden PK 13/14 is designed to stimulated rapid formation in both flowers and produce alike, this innovative product will enrich your crop with high levels of potassium and phosphorous. Basically, House and Garden PK 13/14 stimulates the illusion of a drought in the plant which then halts the growth cycle and forces the plant to enter the budding and flowering cycle.Phosphorus enables the roots to a form solid, study foundation, while potassium helps the growth to fully absorb the nutrients. Both of these nutrients will help bolster the photosynthesis process. This will drastically increase both the weight and size of your crop and will result in a lush, green,healthy harvest. Directions for use: Prepare you nutrient system as you would normally, and then set your EC levels before adding PK 13/14. Dont forget to adjust your pH levels. PK 13/14 is safe to use with all irrigation systems. Never mix your nurses in their concentrated forms. Always follow the directions for you specific crop.